In the documentary The Square, Egyptian director Jehane Noujaim (Startup.com, Control Room) doesn’t do much to contextualize the interviews, news snippets, and in-the-moment footage chronicling Egypt’s recent political upheaval. She reveals little about the lives of her subjects, a handful of people participating day by day in the mass protests in Cairo’s Tahrir Square. She doesn’t identify the talking heads making incendiary comments on television, or indicate whether they’re expressing majority opinions or spouting wingnut extremism. She also doesn’t identify many of the military figures who make promises or issue dismissals, either in the square or in interviews in their own cars. It’s unclear where most of her footage comes from—how much was shot for this documentary, and how much was pooled from other sources. And she doesn’t track any but the largest governmental changes, so it’s never clear how or why the protests lead to change, or what decisions were involved at the top levels. This isn’t a nuanced historical film, waiting to hand-hold outsiders through two years of regime-changing protests, military ousters, and bloody crackdowns. What it is instead is a vivid, impressionistic portrait of the social scene in Tahrir Square, and how street protests gave workaday Egyptians a feeling of empowerment and ebullience that a succession of oppressive, disingenuous leaders couldn’t shake. The Square is a chaotic film, zipping from protest to protest and watershed to watershed, and losing track of its participants for long stretches, only to find them again, without comment. But it’s an appropriate document for a chaotic period, as the country is pulled in different directions by factions that all want change, and generally agree on how to achieve it, but not on the next steps. It’s one thing to topple a corrupt dictator; it’s another entirely to agree on how to replace him, or which group should wield power over the others, and to what degree. The Square starts in January 2011, with the Tahrir Square uprising against Egyptian president Hosni Mubarak. Noujaim focuses on a handful of protestors: fierce, intellectual firebrand Aida El Kashef; The Kite Runner star Khalid Abdalla, who becomes a fearless international spokesman; singer-guitarist Ramy Essam, who gives concerts in the square, performing up-to-the-moment revolutionary songs for thousands of cheering people; and Magdy Ashour, a quiet, older family man and Muslim Brotherhood member who firmly bucks his party’s leadership whenever it seems more aimed at consolidating power than fighting for revolution. But the centerpiece of Noujaim’s film is an outspoken young man named Ahmed Hassan, who spends two years of rebellion explaining to Noujaim’s ever-present camera what he’s feeling in the moment—not looking back with perspective, but in the thick of defiance or defeat. That’s a tone Noujaim sees again and again throughout The Square: a mixture of fatalism, excitement, and conviction, as the protestors bring rocks, chants, and songs to bear against vastly more powerful, well-entrenched forces. But in some of the film’s best moments, she pushes past the rhetoric and even the stunning action of crackdowns and dispersal tactics, and finds her subjects in their homes. There, they watch and react to the news, or consider the toll their activism is taking on their families, or debate the major difficulties among themselves that the enthusiasm of the square sweeps away. The respectful but contentious relationship between Hassan and Ashour is particularly poignant: They’re united in their conviction that the present regime should go, but utterly divided on what should come next, and their factions can’t both take power. 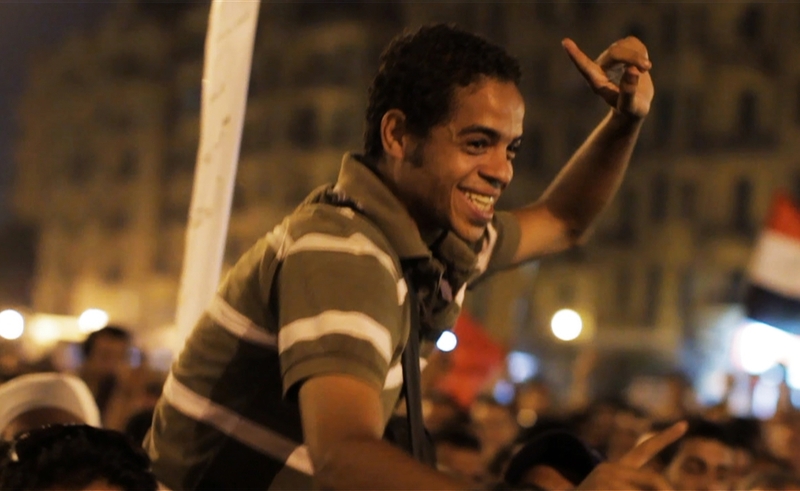 Even for those familiar with the history of Mubarak’s ouster and what followed over the next two years—the film continues up to August 2013, and ends with the open question of what will happen next—The Square finds plenty of new facets to reveal by tracking individual reactions. There are artistic ones: Noujaim punctuates sequences with artificial but powerful interludes, with street artist Ammar Abo Bakr painting after-the-fact graffiti murals about the latest developments, or Essam singing scathing songs about military corruption for a cheering crowd, as soldiers look on impassively. There are personal ones: people in the square sharing tea, or weeping over the latest developments. There are technological ones: Just as concertgoing has changed, with a subset of the crowd determined to capture everything via cellphones and digital cameras, police brutality has changed, and every time someone dies in a protest, they’re surrounded by tiny glowing screens, as bystanders document it all for Internet broadcast, to give the lie to the government’s denials. Noujaim’s documentary often feels scattershot and disorganized in its attempt to bring all these angles into one crowded arena, but while The Square isn’t always cohesive, or even informative, it feels more honest than a more packaged story would be. It catches, in the most authentic and democratic way possible, a collection of people who’ve developed a strong taste for revolution, but are still trying to figure out what to do with it. And in the process, it provides a window into what’s going on in Egypt that no official statement or historical summary could match.